US ambassador to the UN Nikki Haley has described Iran as a “global threat” in a news conference outlining evidence of the nation’s “destabilizing behavior” in the Middle East. Under the current administration the US attitude towards Iran has hardened. Earlier this year, President Donald Trump claimed that a 2015 financial deal intended to limit Iran’s nuclear program has helped the nation fund terrorism. Under the 2015 UN resolution on Iran’s nuclear program, the supply, sale or transfer of ballistic missiles from the country must be approved by the UN security council on a case-by-case basis. 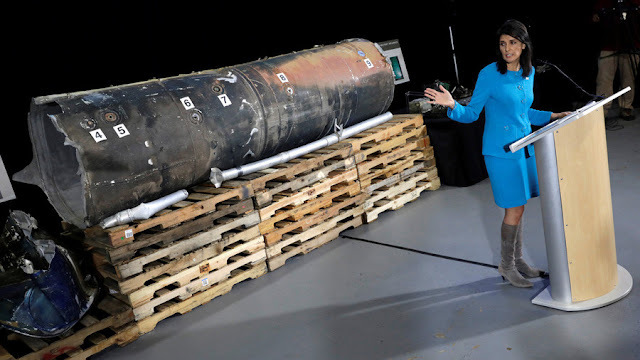 Standing in front of a partially incinerated missile shell purported to have been fired into Saudi Arabia from Yemen, Haley told reporters at a Washington military base that illegal Iranian weapons are spreading throughout the Middle East. Haley said the US will attempt to build a international coalition to “push back” against Iran. She said missiles from Iran have been found in war zones across the Middle East. The Iran government has stated that the country’s weapons program is for defense purposes. The US envoy presented remains of a missile found in Saudi Arabia as proof of Iranian enabled attacks against US allies in the Middle East. Haley said the missile’s intended target was a civilian airport in Riyadh. Weapon parts from a “kamikaze drone” and a boat fitted with a warhead were also mentioned as evidence of Iran backed aggression in the region. A date or location for when this weaponry was found was not announced by Haley. The Government of Islamic Republic of Iran has since released a statement describing the evidence as “fabricated,” report Reuters. Saudi Arabia has welcomed the US stance and called for "immediate measures" to ensure the 2015 UN resolution is adhered to. Claims that Iran has misused its weaponry comes as a new study reveals arms manufactured in Europe, China, and Russia inadvertently fueled Islamic State (IS, formerly ISIS/ISIL) arsenals between 2014-2017. According to the Conflict Armament Research report, the US and Saudi Arabia were the biggest culprits in transferring such arms to regions where they subsequently fell into the hands of ISIS-linked groups. “The United States and Saudi Arabia supplied most of this material without authorisation, apparently to Syrian opposition forces,” the report states. On Thursday, US ambassador to the United Nations Nikki Haley announced that the Trump administration had proof that Iran violated UN resolutions by exporting military-grade weapons to Houthi rebels in Yemen. "The weapons might as well have ‘Made in Iran' stickers on them," Haley said at a press conference at Joint Base Anacostia-Bolling. "Its ballistic missiles and advanced weapons are turning up in war zones across the region." The missile at the heart of the announcement was one fired in November, allegedly by Houthi rebels in Yemen, toward Riyadh airport. Saudi Arabia has been at war with the Houthis in Yemen since 2015. According to Haley, Iran was the supplier of the missile; Not everyone, however, is onboard. ​Speaking to Radio Sputnik's Loud & Clear, Medea Benjamin, co-founder of CODEPINK, called the move by Haley "disgusting." "The US is selling weapons to Saudi Arabia that it [in turn] uses everyday to bomb civilians and kill so many people [in Yemen]," Benjamin said. "And then she has the gall to take this this one fragment of the missile and talk as if this is something totally out of the blue? Of course the Yemenis are going to be trying to get back at the Saudis." "It's absolutely absurd that she's taking this one incident and trying to act like this is an act of war… there has been a war going on since March 2015 with Saudi Arabia being the active participant in the intervention of a country it has no business in," Benjamin added. Rather than standing next to a missile, fellow guest Kathy Kelly, co-coordinator of Voices for Creative Non-Violence, suggested Haley should instead "go and stand in front of one of the four [combat littoral ships] that the US sold to the Saudis that's blockading the ports and preventing desperately needed food and medicine from getting into [Yemen]." "People in Yemen are a step away from starvation… a population of 8 million people could starve to death if the humanitarian supplies don't come in," she dded. As health officials struggle to help thousands of affected Yemenis stricken by the diseases that so often accompany conflict, among them a massive growing cholera epidemic and widespread diphtheria, Benjamin says the move by Haley, and by extension the Trump administration, is simply a distraction. "It is an incredible distraction," says Benjamin. "To try to turn this around with one missile attack that did not hit anybody, didn't hurt anybody, and to pretend that this is now a new phase in this war, is a total distraction." For Benjamin and Kelly, the world is likely to see the starvation of millions of Yemenis as the Trump administration tries to create anti-Iran sentiment among Tehran's neighbors and within the US. The US' ultimate goal, adds Benjamin, is regime change in Iran, though she thinks that's likely not an option.